It's finally happened! Wow changes and improvements to the way we inspect vehicles for the sale & transfer of ownership. The manual that has been our guide for years was outdated and no longer met the needs of todays modern vehicles. This blog comments on some of the changes and some of the issues regarding safety inspections. The changes allow for service facilities to "smarten up" and get with the new rules, clairfies inspection protcols and protects the consumer. That protection is called document, document , document! Improved documentation. Facility must use an actual inspection form, and copy for both the shop and customer to retained for 1 year. Ensuring once it's written your cant go back and change things. Warning lights to be documented, and in some vehicle GVWR failures will occur for certain lights being on. ESC - stability control lights. Need documentation that its on. On vehicle newer then September 2011, the system must work. Window tining will become involved in 2017 - Aftermarket tinting will be tested . Usage of a speciial tint measuring tool will be required by the facility. Instrument panel , speedometer, odomoter requires for inspection for operation, functioning, and lighting in those areas. Drive belts - which were not involved before but are important to vehicle safety now if they were to break. Clairty and more definitions to undercarriage, body rust. Definition improvement on languauge used to explain problems. Such as fluid leaks. There are 3 Levels of fluid leaks, depeneding on how bad the leaks are will determine a failure or not. The manual is VERY CLEAR on what is a pass and what is a fail. No spacers for these "tuner" cars in between the wheel and the rim, making the wheels stick out further then the fender. Wheel bearing were not really part of inspection before, unless they had play . But they are checked now, as well as other updates to the drive lines areas. BRAKES - A painful area on vehicles and the most amount of complaints. Remember there is a difference between what the government allows for safety and what's reality of how low you should go. Brake pads 1.6mm - thats paper thin for a pass!! Reality falires are called at 2-3 mm. Brakes shoes 2/32nds. BRAKE LINES - the most hated and hardest area for buyers and seller to deal wth. He is the answer from Halton Region enforcement office. "if you can flake off rust with your finger on brake and fuel lines - IT FAILS" there is no in between, no discussion! You will see MANY MANY more cars fails on this. Parking brakes - they must work. Period! They also must be visually inspected. So if the parking brakes are housed inside the rear brakes rotors, they must be accessed and visually inspected. There will be additional time and cost for this issues possibly. Safety Inspection are only valid for 36 days, and are NOT a warranty on the vehicle. As of that day an technician inspected and verified the vehicle was fit and issued the safety certificate. After that date if anything changes it is up to the consumer, & the seller to deal with it. Now there are cases where neglect on the part of one of the parties including the inspecting facility can miss somthing or close and eye to an item on the inspection. This is where documentation comes into play and dealing with the Ministry of Transportation. In all my years the Ministry Enforcement Officer will get involved where what was missed on theinspection was obvious that it was not inspected and was there before hand. A light bulb being out, or brakes that barely passed 2 weeks later now fail will not be looked at in detail I feel. Each region culd be different. So you get your safety inspection done, you find out you need work but choose not to have it done at the shop that did the inspection. You can do that, you're allowed. You have 10 days from the date of the inspection to perform the work to proper standards and have it re-inspected by that shop. Now that shop does have the right to charge you for re inspecting the vehicle, and there is no standard fee structure it's up to the shop. If its something like ensuring the windshield was replaced and a brake light was fixed, probably no charge. But new suspension , brake, or body work etc, yes there may be a charge to look at it again. When purchasing a new vehicle understand the safety inspection are meant to ensure your safety, not the maintenance or operating condition of the vehicle. Safety inspections do not get into tune up inspection, fluids and filters, cooling systems, interior components etc hence the reason for getting a detailed inspection done before buying. We see cars here at Sils Complete Auto Care Centre for CAA Vehicle Inspections all the time after purchasing a car only to advise them on issues that should have been caught before buying. Rusted brakes lines, missing spare tires, neglect on fluid care, rust body sections etc are all typical comments. Some require the new owner to go bck to the shop other are goodto know advice. Last week we had a 2003 Honda Civinc customer. Two weeks before he bought the vehicle from a used car lot it need exhaust work, ignition work and the brakes lines and fuel lines were in horrible shape. Now the exhaust work he paid for soon after getting the car, thinking it was his problem. The ignition work is not part of a safety inspection and his problem. BUT the brakes lines were an issue long coming. We advised him to go back to the selling dealer and discuss the matter. Surprising the dealer gave him his money back right away and he then brought us another car to CAA Vehicle Inspect 1st before buying a 2012 Toyota Corolla. This doesnt happen that often and probaly will never happen in a private sale so be careful before dropping the cash. 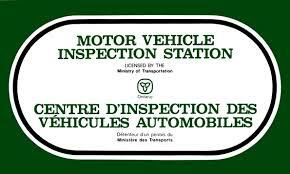 These changes are long past due and will take some time for all certified motor vehicle inspection stations to be profficient at doing them.